The summer before I entered the Jesuit novitiate, I hired a van with a group of friends and we drove around France for two weeks following the Tour de France through the Alps and the Pyrenees. It was a magical summer, we would arrive on these incredible mountain passes the night before the stage, just before they closed the roads off. The night was spent partying with Spanish / French / Dutch etc cycling fans and then the next day the excitement would build as the race approached. These men were the greatest athletes in my opinion, in the most gruelling sporting event on the planet. The crowds on the big climbs would number in the hundreds of thousands, and because of the steep incline of the climbs, the exhausted cyclists, strung out in little groups – would pass by at a much slower pace than on the flat or downhill parts. If I close my eyes the one image that sums up that summer was seeing Marco Pantani leading the peloton over Les Deux Alps. One of the greatest climbers of all time – he would dance on his pedals and soar through the mountains like an angel. Six years later he died of a cocaine overdose in a grotty hotel in Rimini, Italy. 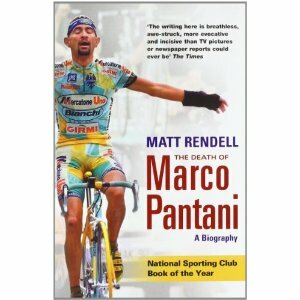 I have just finished reading a gripping book about his life, called, ironically, ‘The Death of Marco Pantani‘ . The life and death of Marco Pantini could be a parable for our times. As modern sport has become more important politically and commercially the consequences of success and failure have been blown out of proportion. Cheating in sport has been around since ancient times, however it was in East Germany and its notorious Programme 1425 that lead to thousands of uniformed youngsters being given steroids, when cheating became systematic. In Finland they developed the technique of using blood transfusions in sport – which required access to labs, medical expertise and much larger budgets. What is shocking is the risks these cyclists took, the strain of the heart pumping thickened blood, meant that many cyclists had to sleep with heart monitors which would set off an alarm when their heart beats dropped below safe levels. Following the Tour in 98 there were rumours of groups of cyclists jumping out of bed in the dead hours of the morning to leap on exercises bikes to get their hearts pumping again. Tragically at the end of the book, in the epilogue, there is a list of 8 cyclists who died of sudden heart attacks between 2003-5. So the current insistence of Team Sky to be clean, and the scandal of Lance Armstrong’s cheating and bullying are so important. Worryingly as sport becomes more important – maybe as a symptom of a society that is losing balance – Sports stars are prepared to risk everything for that moment of glory. St Ignatius calls this lack of balance a ‘disordered attachment’. Alarmingly, with the rise of Paralympics, the spectre has been raised of athletes deliberately dismembering themselves in order to compete. Especially with the controversy around Oscar Pistorius and others ‘blades’, as technology continues to improve soon blades will be superior to the leg, at least on the 100m’s track. When a ‘disabled’ sprinter starts to break Usain Bolt’s World Records – then there will be irresistible pressure to lose your legs just to compete….. No wonder the Spiritual Masters consistently warn us against disordered attachments to fame and glory. You point towards some grave warnings Fr Tim. It is such a shame when athletes cheat in any way, especially by using performance enhancing drugs. They, in their turn face shame and disqualification (sometimes for life) from their sports and a life of shame after that. It seems to me that St Ignatius got it right.